Oh, I'm in love with these mice! Read me ~> Work in continuous rounds, do not join. I used Red Heart Super Saver and also Red Heart Comfort yarn with a 3.75mm hook. I also used thread with a 1.25mm steel hook and also sport weight yarn with a 2.5mm hook so this pattern can be worked with different sizes of hooks with different kinds of yarns depending on what size of mouse or what kind of coat you want the mouse to have, Have any questions or if you come across a mistake in the pattern please leave a message in the comment section below. Whip stitch in a nose with thread or embroidery thread or yarn. I also think they are just as cute without a face but the choice is yours and there's many things you could do with the face. Bring one thread tail up from under the head and leave the other thread tail hanging where you went in. Whip stitch the nose in. Once done then bring both thread tails out a stitch hole away from the face, knot the tails off and hide them inside the body. View the video for tips on sewing in the nose. 12) 1sc in next 5st then 2tog (12) *start stuffing the body. Stuff it firm, pushing the stuffing into the sides near the back end to give the body a more triangular shape. View video for tips on stuffing. 14) 2tog twice then f/o leaving a long tail for sewing, you will also be using this yarn tail to crochet a chain for the tail. Using a yarn needle, neatly weave in and out of the remaining stitches, pull tight to close the gap and neatly knot off then pull the yarn tail inside the body and right out the back through the magic circle you started the body with. f/o and leave long tail for sewing. 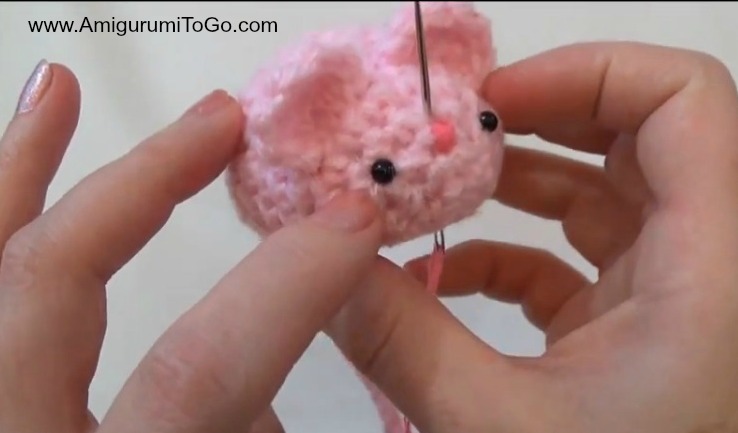 Sew the ears in between the 10th and 11th row. Pin them in place before sewing them in. When all done, bring the yarn tails out through one hole in the body, knot off then hide inside the body. THANK YOU...for making a beautiful five year old granddaughter happy this Christmas (if I can come anywhere close to your renditions!!). The tinier, the better in her book!! so cute, thank for the tutorial. does it matter if I use a 3.5mm hook as opposed to a 3.75mm??? My biggest issue is that I cannot figure out a good way to hold the yarn. It either cause too much tension or is just a mess. when I first started I had a hard time holding the yarn too. It takes practice and each one will get easier. Hang in there.. never give up, just take breaks. Loving these little mice. Going to give it a try today hope they turn out. I've been watching videos for about a week now. I make bandanas for the shelter puppies and would really like to be able to do these for kitties. Thanks for sharing your talents. I made ond mouse with music box in it, but it was too small. 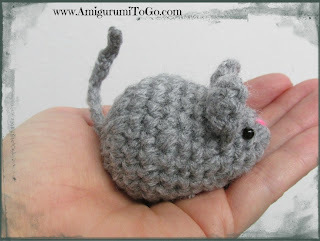 I want the same hook and the same cotton, but how can I adjust the pattern to make the mouse a little bigger? Thank you for the pattern and the tutorial. I made 3 for my cats and I added bells on their tails. I crochet cat toys for Rescues. Thank you for sharing all the beautiful patterns you've designed! 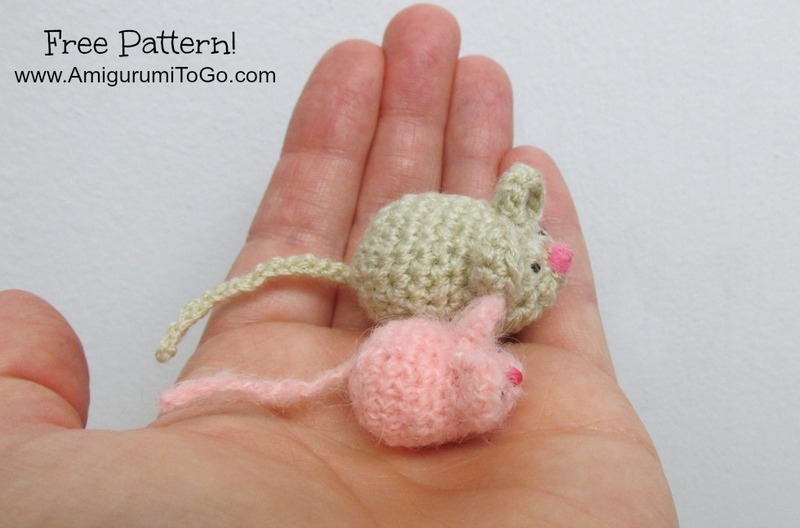 Love making the mouse/mice in cotton yarns and filling with catnip & fiberfill. 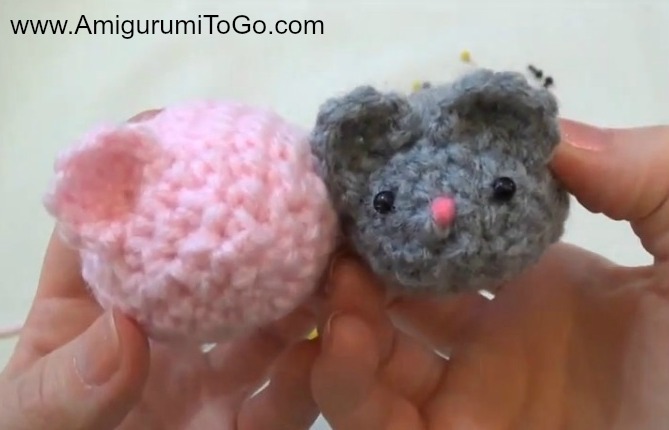 So happy to find amigurumitogo...I will follow you anywhere, donate when I can. It's not often a designer makes no demands on their patterns use. I've seen 'threats to prosecute" on some blogs....no thank you! Tomorrow 11/26/15 is Thanksgiving....Happy Thanksgiving to you and family, and to the wonderful community of crocheters! That is an awesome thing you're doing! Please, don't feel obligated to donate, you doing what you do for animals is payment enough for me. I'm just so happy you've chosen one of my patterns to pay it forward, that's an honor for me! Wow, when my eyes fell upon 'threats to prosecute' I actually laughed out loud then took a moment to think about that, how awful, not a laughing matter really. Actually, you are legally allowed to do with whatever you please with any item you make with your own hands, unless you sell something using a licensed character's name like "Mickey Mouse" or "Pokemon" since those names are not ours to sell. But you can sell a mouse or any other thing you make. You can give it away, throw it away or sell it. A designer's only legal claim is to the written instructions and that's where their (our) rights end. A designer can not reach into your life and control what you do with your crafty items, that's just crazy and way out of legal bounds. I've got 12 foster kitties that I want to make catnip mices/meeses for, we'll see whether or not I succeed. Your video makes it look so simple, but I'm sure it will take until Christmas for me to get the hang of it! Wish me luck! Thank you so much for this pattern and video. It was sooo easy to follow, and I used it to make my first ever crocheted item! I, too, rescue and foster kitties, and tonight, three of mine gave my their paws up! I don't know how to attach pictures, but it's really cute. try it with a 3.5. Lighter weight yarn calls for a smaller hook. It will work it will just be smaller when you're done. Have fun! I made one of these and before I could finish it my cats took off with it. Guess I have to make another one. Lol. I absolutely love your patterns and have almost made everyone of them. The link to where you buy the safety eyes is not a working link. Can you check on that and see what the problem is please? Thank you so much ando thank you for these easy to follow tutorials!! where is the link that doesn't work? I just tried the one on my FAQ page and it worked fine for me. Thks so much for sharing! I'm making a whole lot of miniture animals for my granddaughter. Your site is a real gem! This was so fun to make...adorable!